That was my initial thought as I jumped (literally, this thing is HIGH) into the Jeep Wrangler. As I worked my posterior into a fresh groove of the driver’s seat, a glance round the cabin left me questioning what I’d just let myself in for. This is, of course, a technology website first and foremost, but clambering into the Wrangler was like taking a step back in time. I’m not talking as far back as the Ford Model T, hell I’m not even talking pre-2000s, but the sparse interior is several steps removed from even the affordable – and dare I say, plush – super minis currently on the market. For a car starting at a touch over £34,000 ($23,995, AU$42,000) you’d expect a certain level of finish and technology for your money, and although I had my hands on the Overland trim - which includes the 6.5-inch touchscreen UConnect and sat nav system - it still felt prehistoric in today’s market. 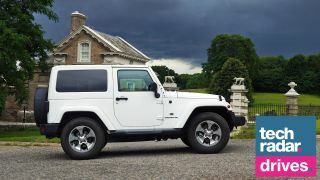 The large rivets on the outside of the doors, the no-nonsense wheel arches and oversized front bumper, the industrial looking fuel cap and overall boxy design are your first hints that the Jeep Wrangler doesn’t follow the current SUV norm of fusing premium comfort and luxuries with pseudo rugged credentials. There’s no mistaking the Wrangler’s intentions. It wants to get to work on twisty country roads and bumpy fields, not on urban streets ferrying kids to and from school. Don’t get it wrong, it can do that – there are rear seats with enough legroom - but it never feels at home in the middle of a city. Shifting attention back to the 6.58-inch touchscreen and it’s fair to say the resolution, interface and features are more suited to a car several years older than the 2016 Wrangler. Linking my phone to the Jeep’s UConnect system felt a little antiquated, with a peculiar voice command system I needed to follow in order to pair my OnePlus 5. It was impressively good at speech recognition, but it certainly wasn't the most intuitive system I've used. I had to look up instructions on how to pair my phone wirelessly, as it wasn't obvious from just looking at the screen, which meant I initially connected my phone to the car using a 3.5mm audio cable to listen to Spotify. A novel, yet frustrating workaround before I had the time to look into the system further. Some of the increasingly popular driver assistance features are also MIA, with no reversing camera or parking sensors, which would have been handy in a car as wide and tall as the Wrangler. I'm someone who loves tech, especially in cars - give me Apple CarPlay, Android Auto, multiple cameras and a gesture controlled music player - I want it all. The elevated seating position in the Wrangler does wonders for boosting the ego, and it provides a commanding view of the road ahead – as well as the cars either side of you. The relatively sparse cabin and upright windshield meant I was focused more on the world outside. I was more aware of the wheel in my hands, the ride, the road… I was driving, and I was acutely aware of that. It was a great sensation. As I barreled my way into the countryside the Wrangler felt more and more at home, down the bumpy tracks the huge tires and sizable suspension softened the blows and then – as the temperature dipped and the rain began to lash down - the Jeep surprised me. The tech came to my rescue! In terms of sound insulation the Wrangler offers very little, but as the heavens fully opened and hammered onto the bare metal roof my right index finger found a button on the rear of the steering. Oh hello, volume up. The Jeep Wrangler Overland comes with a premium Alpine sound system as standard, which includes a rather meaty subwoofer built into the floor of the boot (trunk, for those in the US). To call it a boot is generous though, as you can just about stand two small flight cases upright, or a handful of grocery bags, and that’s it. But back to that sub, and the audio system overall providing the beats per minute I required as I continued on through the storm. It was music to my ears… quite literally. The uncovered frame of the car also means it’s not the best at retaining heat, but as I reached for the traditional temperature control another button caught my attention. I’d not seen it before, shoved at the bottom of the center console, almost hidden behind the gear shift, but there it was. Heated seats, yes! As the warmth radiated through my backside and up my spine a smile crept its way across my face. The sky was dark, the rain torrential and the roads rough. This, this right here, this was driving, and I was in heaven.